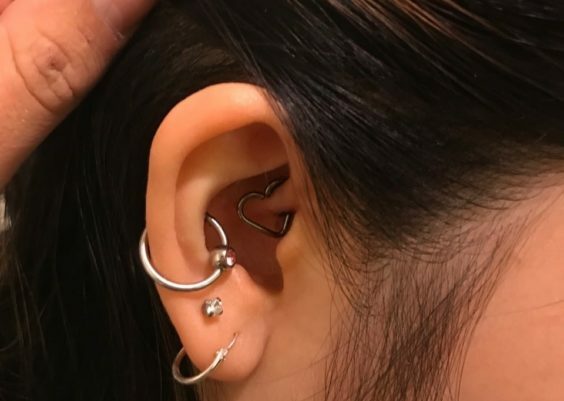 You have probably experienced the traditional lobe piercing at an early age and don’t even remember what it felt like. Whether your ear was infected or not? And how much time it took to heal fully? What caused the infection in the first place? Since this happened a long time ago, you do not need to get into the details. But if you are planning on getting your ears pierced now and looking for information regarding the types of ear piercings and their placements you should also make sure that you are aware of what risks an ear piercing entails. Since you are dealing with flesh, blood, and cartilage, you can never be too careful. In addition to this, you need to be aware of the placement of the piercing on the ear and the amount of pain you will be suffering once you get the piercing done. 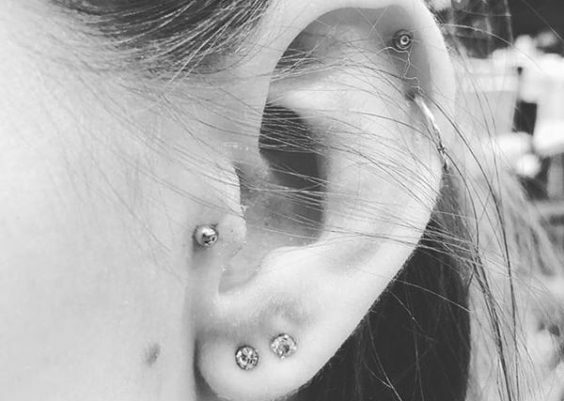 Not all ear piercings are comfortable as the lobe piercing and will require varying amounts of time to heal. This also depends on whether your piercing gets infected along the way which will cause a significant delay in the healing time. Ear piercings have gained significant popularity over the years as a fashion statement, and with the help of technology you can try out a variety of styles. The jewelry also offers a variety of choices and depends on the piercing you have. 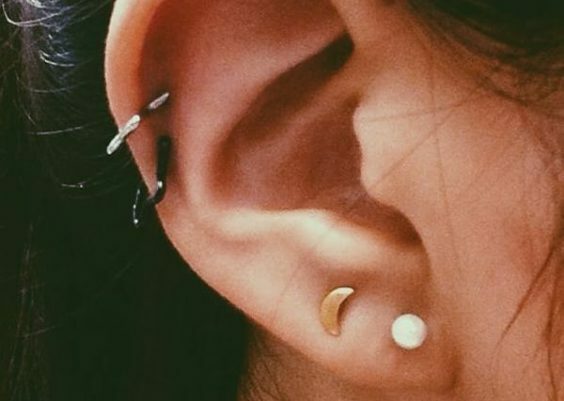 You can try out dainty pieces for rook piercings and go the hoop way for lobe piercings. There is so much to choose from. As someone who wants to flaunt their latest piercing, it is not fun to deal with an infected ear. Moreover, infections can get pretty severe and even damage the ear structure permanently. Ear Piercings are considered quite safe, and most people do not expect an ear piercing to go wrong, but ear piercing infections are indeed a reality. If you are well informed and follow proper advice for ear piercings, you can get a fully healed piercing without a bump in the road to healing. After the piercing procedure, the professional will give you a certain period of healing. But if you are feeling tenderness, swelling, discharge or redness, then it is possible that your ear piercing is infected. There are several reasons why your ear can get infected. Infection is usually caused by bacteria entering the pierced wound and spreading. The longer your wound takes to heal the more prone it is to infection. It is not necessary that a mild swelling is a sign of infection, but you can never be too sure, as soon as you feel even the slightest change in your piercing immediately start its treatment. Piercing infection symptoms are quite similar to any other skin infection. The effects of bacteria entering an open wound can be significant and damaging to the complete structure of the ear. Especially if you have opted for one of the problematic placements, dealing with the infection may not be easy. The best way to get your ears pierced is by using a hollow needle. Make sure the place you are getting the piercing done is using a needle and not a gun. Guns tend to carry bacteria and skin residue despite being thoroughly cleaned out. This can increase the chances of getting an infection a great deal. Moreover, the guns are also very damaging to the tissue and will cause a lot of pain. Needles are the most hygienic way of getting the piercing done. Most piercings will last for a few minutes, and all you will feel is a sharp pain and then throbbing. But the pain depends on the placement of the piercing. Infections can alleviate the pain to a large extent and cause severe damage to the piercing. A needle is inserted directly through the skin, and a piece of jewelry is fixed onto the ear with the help of the hollowed out part of the needle. But, germs and bacteria can enter the piercing if the piece of jewelry or the needle is not sterilized beforehand. Even after sterilization, there is no guarantee that bacteria will not enter the wound. The cleaning, however, reduces the chances of getting an infection significantly. Infection can also be caused by the piercing id done. This can happen if you do not follow the instructions of the piercer and maintain a cleaning regimen for the piercing. Neglecting proper cleaning and care for an ear piercing can e one of the top causes an infection occurs in the first place. No matter where you get the piercing done your piercer will provide you with a list of instructions and products to keep the piercing clean and promote healing. If you are negligent about the aftercare, there are very few chances that you will not get infected. Infections can also be a result of the reaction. This can be a severe reaction to the material used in the jewelry. Most first-time jewelry is made using metals. However, before you get your ears pierced, get an idea of what types of metals do not work for you and whether you are allergic to any specific kind of metal. You can also take your jewelry to the parlor and get that inserted to prevent a reaction. If ear piercing infections are not treated immediately, there is a high likelihood that the bacteria will multiply and make the situation worse. This is why as soon as you see even the slightest symptoms of infection start the care required to get rid of it. 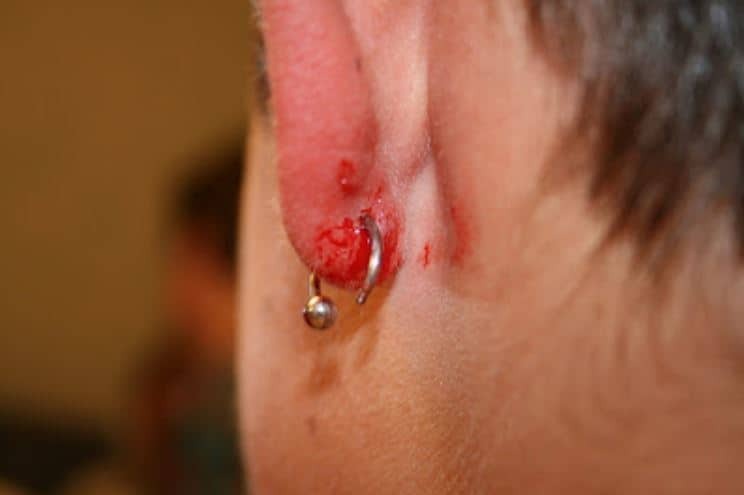 If ear piercing infections aren’t treated immediately, they may turn into severe problems where you have to be treated using a high powered antibiotic. With any infection, prevention is key. Once you are aware of an open wound proper care is necessary to prevent bacteria from entering it. You have to extremely careful as bacteria can be contracted anywhere and is even present in the air around the wound. Make sure that they use needles to create the piercing and all their tools are sterilized, check for disposable needles and sterilization machines. Clean the piercing at least twice a day with the recommended product. Do not touch or play with the piece of jewelry in a fresh piercing. If the pain in the actual piercing remains severe and there is any bleeding immediately see a doctor as it is not normal. If you see any signs of infection do not touch the area with your hands to inspect it as this can spread the bacteria, making the wound irritating in the long run. Use cotton swabs and clean out the area with whatever your piercer has advised you to clean it with. If you are not sure, you can create a 1:3 ratio of hot water and salt to clean it. Do this at least twice a day. You can clean the wound by adding a few drops of lavender or eucalyptus oil to the salt and hot water mixture. Essential oils hold excellent antibacterial properties that help keep the wound clean and prevent bacteria from spreading as well. After cleaning the wound thoroughly, you should apply a warm compress to it. Hold it in place for at least 20 minutes, this will help with blood circulation around the piercing, and you will notice the healing speed up. Benzalkonium chloride solution is a great antiseptic which can be used to treat an infection physically. After the area is thoroughly cleaned out and dried, pour the solution on a cotton pad and dab your ear with at least twice a day to help speed up the healing process. Avoid using it if your skin is blistered or there are rashes. You can easily find this solution on Amazon. Antibiotics are a great way to treat an infection where there is yellow discharge coming out of the wound. Neosporin is an antibiotic cream that can be used to treat and dry out the infection. This should also be applied using a cotton swab after the wound has thoroughly been cleaned and dried. The recommended application is for twice a day. Use this cream for at least a week. If the pain and infection persist, you need to see your physician immediately. Some cases of infection require an oral dose of antibiotic. It is best to seek medical advice as piercing infections can get out of hand.